Action: sign up to our ‘inSRI’ newsletter here! Fund EcoMarket ‘Screened, Themed and Engaged’ brochure – showing suggested advice process, and how sriStyles meet the ‘Big 3’ client SRI/ethical aims. This is designed as a six side folding A5 brochure. Two download options: 6 x A4 pages for better readability. Or – Front/back 2 x A4 pages to show original layout. May 2016 PFS/IIL ‘Bringing Sustainable Responsible and Ethical Investment into the advice process’ event Podcast and presentation slides link . Slides also available here. Citywire ‘Adviser KnowHow’ interview with Julia Dreblow for New Model Adviser February 2016 – see below. Moneyfacts SRI feature January 2015 ‘Ready to play ball?’ by Julia Dreblow. The article is available here. 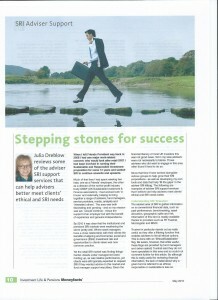 Capita Connections magasine ‘Because it IS about the Money, Money Money’, SRI article by Julia Dreblow (Or link to full magazine here). Published December 2014. 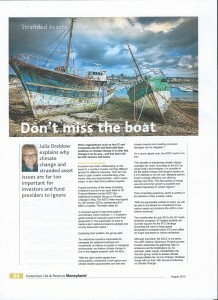 Investment Life and Pensions Moneyfacts SRI article June 2014 (3 pages) here. ‘SRI StyleFinder’ Fact Find, from sriServices – A client microsite with generic SRI styles information and fact find questionnaire. The following link can be sent to clients or embedded into an adviser’s own site. http://stylefinder.fundecomarket.co.uk . This questionnaire is also ‘printable’ and may be available for ‘white labelling’. Capita Synaptic Fact find. Revised Capita Synaptic Ethical factfind Nov 13. This is an ‘issues and approaches’ based questionnaire that relates to the Capita/Synaptic Research fund tool. Client Video. A two minute B2C PPT video for use by financial advisers (please note advisers are responsible for any compliance aspects). See below. 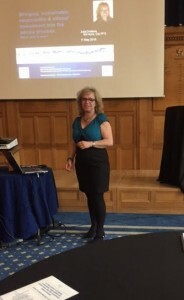 Adviser Bootcamp (Blue & Green Tomorrow) SRI training event pdf – download information and slides , the first of which is ‘Dynamism, Diversity and Collaboration, the way forward in retail SRI’ by Julia Dreblow. ‘Responsible Engagement’ research by sriServices press release, 12 March 2013 – shedding light on welcome ‘behind the scenes’ activity at F&C Asset Management, Jupiter Asset Management, Kames Capital, Legal and General Investment Management, Scottish Widows Investment Partners and Standard Life Investments. Adviser Video: an ‘Introduction to Fund EcoMarket’ by sriServices, our SRI database tool for financial advisers – an easy to use tool which segments SRI options into ‘SRI Styles’ – see below. ‘Adviser Guide to SRI’ a Rayner Spencer Mills and sriServices collaborative project, kindly sponsored by Ecclesiastical and F&C, which introduces key SRI/ethical investment advice concepts and includes an SRI fund list split by Styles. Register here for 2012 pdf download of the guide . FTAdviser guide to SRI – 60 Minutes CPD, which includes a range of commentary from GAEIA, Alliance Trust and sriServices. FSA document FG12/15 – sriServices commentary on the compliance and business implications of the many references to ethical/SRI found in this recent final guidance document. SRI Styles ‘Strategic Drivers’ diagram – click here to a download (pdf) diagram (from sriServices) which introduces the diverse range of balances been ‘values’ and ‘financial objectives’ across the SRI spectrum. Please be aware these are indicative only. To find out what else is available on this site click here for a sitemap. Please note this material is for information purposes only and is intended for use by authorised UK financial advisers only. You should check your own compliance proceedures before using any of these materials with clients.